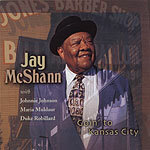 CD review: "Goin' to Kansas City"
Jay McShann has been on the jazz scene so long that when you a see a "new" album by him at the record store, it's more likely to be a reissue of some of his classic recordings from the 1940s or '50s than a new effort. A young Charlie Parker once played in his band, and McShann's big band replaced Count Basie's atop the Kansas City pecking order when Basie blew town for Chicago and then New York ... in 1936! And yet here is McShann with a new studio effort, and one that shows him still a master of the KC school of blues jazz, still a swinging presence on keyboards and a singer of taste and passion. Is he still the same musician he was, say, 50 years ago? Yes and no  if he's lost some of the fluidity to his singing, he's added wisdom. If he can't play quite as much piano, who will argue the point that he plays better piano now? He's joined on this new outing by former Chuck Berry pianist Johnnie Johnson, singer Maria Muldaur and guitarist Duke Robillard, among others. The songs range from old jazz classics like "Kansas City," "Trouble in Mind" and "Ain't Nobody's Business" to the old Nat "King" Cole hit "When I Grow Too Old To Dream." McShann is an American treasure, and to have him not only still with us but still able to perform up to his old standards is a joy not to be missed.